She is such a doll! This is great! Sharing with my rescue group! Thank you ...Bonnie & Jeanne! For both of your comments....wonderful recipes in this cookbook. What a great idea for a cookbook Nancy! My three babies will love you forever, lol! Thank you!!! Doggies everywhere will enjoy Chicken Dog Food. 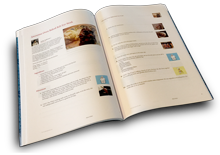 Thanks for including my recipe in this interesting cookbook.